In addition to the Quizzes feature we launched a few weeks ago, we are now bringing you another fantastic tool to enhance classroom learning. Introducing Studyclix Flashcards! Flashcards have been a popular memorising tool among teachers and students for decades. When done properly, flashcards can be an efficient method of getting students to retain information as they learning through active recall. Many students spend hours and hours making our hundreds of flashcards for each of their subjects. With Studyclix’s Flashcards, we’ve taken the hassle out of making your own flashcards and produced high quality and relevant flashcards for the Leaving Cert and Junior Cert syllabuses. If your school has a laminator we highly recommend you laminate the flashcards. If not, try to print the flashcards on thick card rather than paper. Flashcards in the classroom are passed between many students so it’s important to keep them intact! Flashcards can be used in a variety of fun activities. Here are some examples. 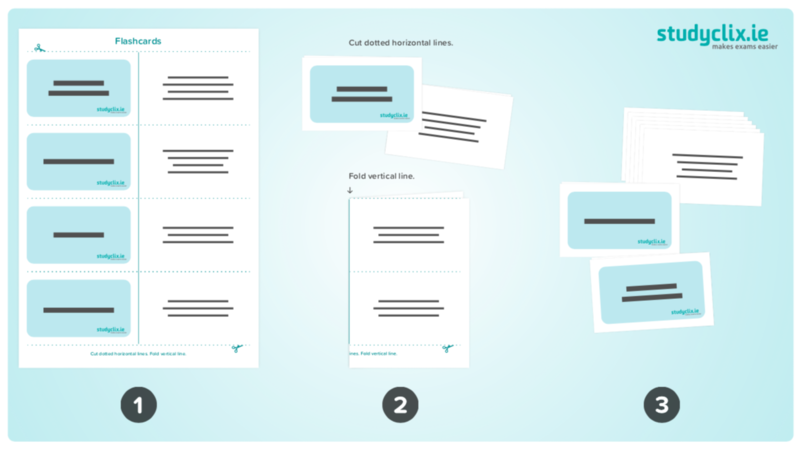 Pair Up: Divide students into pairs and give each pair a set of flashcards. Ask the students to take turns quizzing each other on the definitions. One student holds a flashcard up on the keyword side while the student sitting opposite them has to answer with the corresponding definition/vocab word. Ask the students to repeat the exercise until they answer all the flashcards correctly before switching. Rotate the sets of flashcards between the pairs. Around The World: To play this game, get the students to stand up and form a circle. Choose a pair of students to go head to head to begin the game. To start, hold a flashcard up and the first student to say the corresponding word first gets to move on and compete with the next person as the other students shifts ahead in the circle. The goal is to get all the way around the circle and back to the student’s original spot. Memory Matching: To play this game, two sets of flashcards must be printed out. Get students to stand over a table and lay one set of flashcards definition side up and the second set facing up the keyword side up. Have students take turns making a match until all the flashcards are matched up. For added competition, introduce races and time trials! We're in the process of creating Junior Cert flashcards, so keep an eye out for your junior classes in the near future! Let us know if you have any feedback!